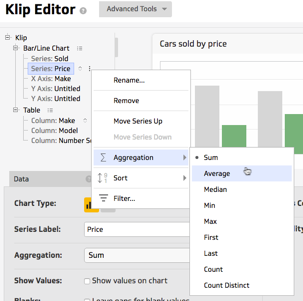 You can now Filter, Group, Aggregate, and Sort on visualizations without the use of formulas on all components. You can use both formulas and actions to build your Klips. Formulas execute first and actions execute second in displaying your visualization. Actions should be applied after formulas. The videos in this article refer to "Additional data". This term has been updated in our UI to "Hidden data" but is otherwise unchanged. You can use actions on Hidden Data (Additional Data) allowing you to modify your visualization with added Data sub-components. 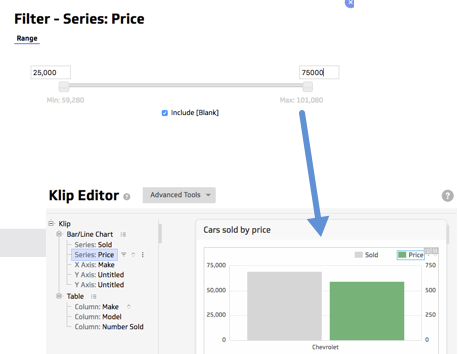 The actions applied to these additional sub-components change your visualization but do not add Series, Axes, Columns, or other elements to your component. 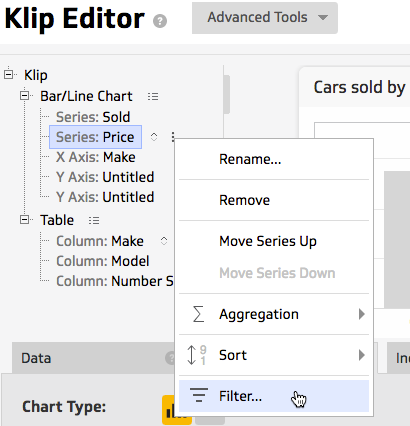 To apply a Filter, click the menu next to the highlighted row in the component tree and select Filter or right-click the series in a chart or a column in a table. You can also click Add Filter in the Properties panel. Learn more about the Filter action. When the Filter action is selected from the More Actions menu, a Filter dialog appears. The result of the applied filter can be seen in the Klip visualizer. The type of filter available is based on the data and component. For example, text is filtered with a pick list, while numbers are filtered with a slider or input box. User Input Control components always use a pick list. When a filter is applied, a hint is displayed next to the series or column row in the component tree (as shown below). After applying a Group, Series data can be aggregated with standard aggregations including Sum, Average, and Count Distinct. 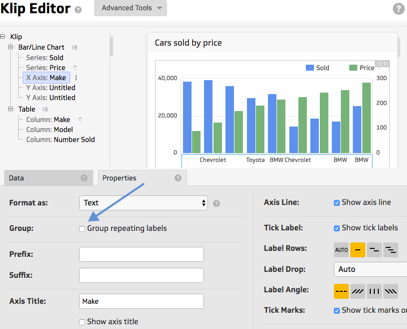 Group and Aggregation settings are available from the component tree and the Properties panel. To apply a Group, right-click the sub-component, click the menu next to it in the component tree or check Group repeating labels in the Properties panel. To apply an Aggregation, click the menu next to the sub-component in the component tree and select Aggregation or right-click the data in the component visualization to access the More Actions menu. You can also use the Aggregation menu in the Properties panel. To apply a Sort, click the menu next to the sub-component in the component tree and select Sort or right-click the data in a component. You can also use the Sort menu on the Properties panel. Note: You can apply a Sort from the More Actions menu or use the SORT function. Only one Sort (the most recent) is supported at a time. The Sort action is always applied last. When a sort is applied, a hint is displayed next to the series or column row in the component tree (as shown below). To see if any actions have been applied to your visualization, click the asterisk icon (*) next to the visualization type name. A list displays showing applied actions. You can delete actions applied to your visualization from this list.